Cats_Luna (Lucie) and WildRoses (Anne Marie) are the two entities behind the MoonRoses Team. They are very big fans of CLAMP and their dream is to be able to make at least one costume of each of their series. They went on stage for the first time at Anime North in 2004, where they got hooked. Since then, lots of projects have happened without losing the fun and adventurous side of the first time. Their motto: "Sleep less to produce more!" or "What did we get into again?" Always searching for new techniques or new things to learn, the MoonRoses love sharing their knowledge. 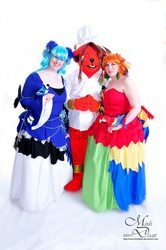 They also love to participate in the community by being panelists, judges or even running some masquerades or other events/departments at conventions. They also appear in the media (like TV) to promote cosplay. Even with their very busy schedules, their workshops are always open to help those in need or who want to learn more about cosplay.